explodes into an Access 2007 database and a ReadMe text file. 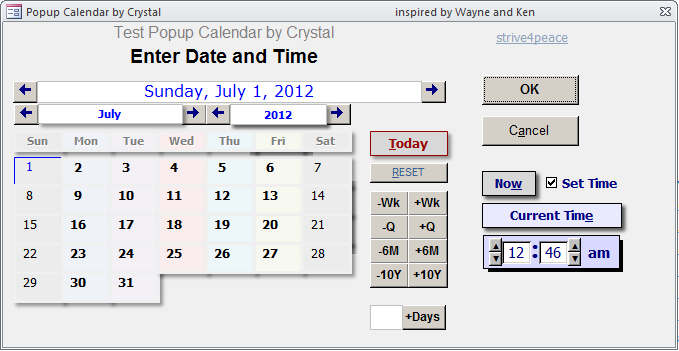 Popup Calendar that works with Access 2007 and above! No ActiveX controls. Everything is built using basic Access controls. The design and code are open. f_PopupCalendar_Test loads automatically when this database is opened. 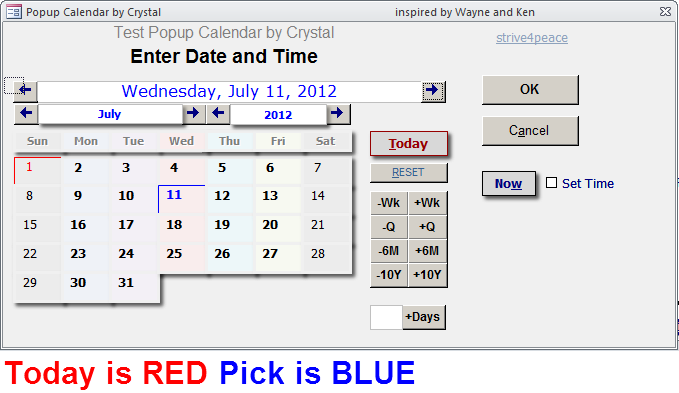 It is not needed for the calendar -- it is only in the database as an example of how to use the popup calendar. COMPILE THE CODE BEFORE YOU RUN IT! The database is not compiled. Whenever you change code, references, or switch versions or operating environment, you should always compile and save before executing. 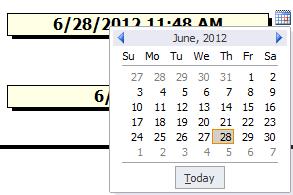 the popup calendar reads the ActiveControl to get date and, optionally, time if it is filled out. When OK is clicked on the popup calendar, the control you came from is updated with what was chosen. You do not have to test for a weekend, all the days can be bold. There is a parameter in the procedure that colors the controls to determine if weekends will be treated differently. If you are using the popup calendar to collect information for something else, you can send an OpenArg with a date and the ActiveControl stuff will be skipped. This is not tested ... the logic is in there and commented. This has tons of uses and other applications with slight modification. I have a version of this that checks to see if the calendar is being used as a subform and if so, it sets Visible and Left for buttons with something particular in the Tag, and changes the form width. I have included a procedure to Update External Forms, and it is called every time the calendar is set. This makes it easy for you to hook the calendar in to your application. ... whatever you use on a regular basis.